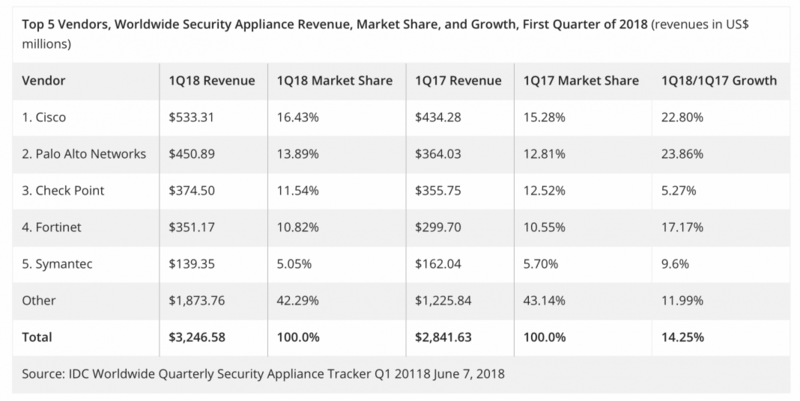 According to the IDC worldwide quarterly security appliance tracker, the total security appliance market saw positive growth in both vendor revenue and unit shipments for the first quarter of 2018 (1Q18). Worldwide vendor revenues in the first quarter increased 14.3% year over year to $3.3 billion and shipments grew 18.9% year over year to 838,098 units. The trend for growth in the worldwide market driven by the Unified Threat Management (UTM) sub-market continues, with UTM reaching record-high revenues of $2.1 billion in 1Q18 and year-over-year growth of 16.1%, the highest growth among all sub-markets, says IDC. The UTM market now represents more than 53% of worldwide revenues in the security appliance market. The Firewall and Content Management sub-markets also had positive year-over-year revenue growth in 1Q18 with gains of 17.4% and 7.5%, respectively. The Intrusion Detection and Prevention and Virtual Private Network (VPN) sub-markets experienced weakening revenues in the quarter with year-over-year declines of 13.0% and 3.0%, respectively. The United States delivered 42.3% of the worldwide security appliance market revenue and was the major driver for spending in Q1 2018 with 16.7% year-over-year growth. Asia/Pacific (excluding Japan) (APeJ) had the strongest year-over-year revenue growth in 1Q18 at 15.9% and captured 21.0% revenue market share, according to IDC. The more mature regions of the world – the United States and Europe, the Middle East and Africa (EMEA) – combined to provide nearly two thirds of the global security appliance market revenue. Both regions had positive growth in the single-digit range. EMEA saw an annual increase of 11.6%. Asia/Pacific (including Japan)(APJ) and the Americas (Canada, Latin America, and the U.S.) experienced year-over-year growth of 13.1% and 16.3%, respectively. The first quarter of 2018 exhibited strong growth for network security due to consistent double-digit growth across nearly every region and continued momentum from UTM as vendors reported $240.6 million more in revenue for 1Q18 than in 1Q17. Firewall and UTM are the strongest areas of growth as network refreshes drive perimeter security refreshes and as vendors add new features and improve performance across all product lines, says IDC.